The autumn term has started and predictably, things are a tad busy at work and I've just started work on a new project. Thursday and Friday last week were spent in meetings, where I discovered that I'm unlikely to make it to the NEC for the Hobbycrafts/Crafts For Christmas show as I'll be working that weekend. It also seems I'll be heading off to Stirling in early November for a technical working group and I need to sort out some dates for training next year. In the wake of all this, Dave abandonned Coventry for Ripley leaving me alone for the weekend as I was on call. On call means I 'volunteered' to stay close to a phone and able to respond within half an hour if there was a problem with any of the systems I support. Fortunately, it was a quiet weekend and I didn't get called, so after doing the household chores I decided to spend some quality time trying to get to know my spinning wheel. I bought some Blue Faced Leicester from Wingham Wool Work last week and it is beautiful, with a lovely soft hand to it. The staple fibres must be at least 12cm long and it is a gorgeous blend of colours, described as humbug on their website. I tried to take a photo of a single fibre for this blog, but my camera fu failed me and the single fibre kept floating away, refusing to sit nicely beside the ruler so you could see how long it was. 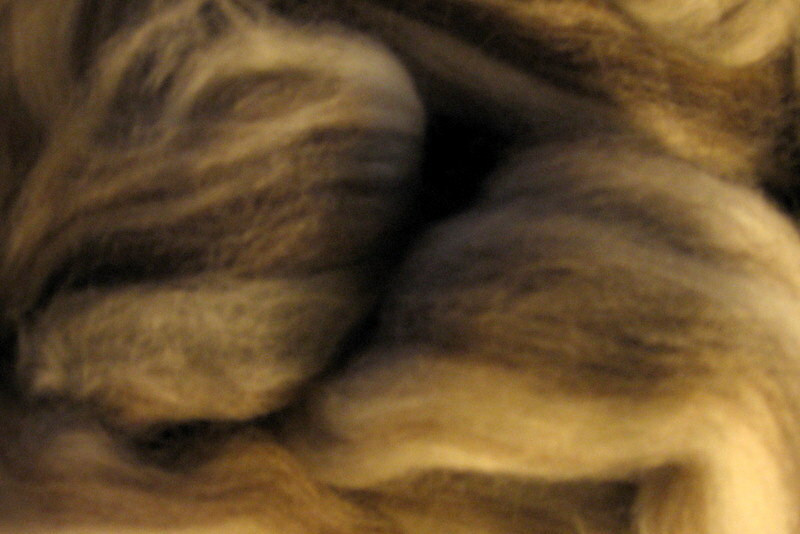 Instead, I took a photo of the fleece itself so you can hopefully see the blend of colours. I dragged the wheel out of its corner, dusted it down and unwound from the bobbin the semi felted fluff I'd spun up a couple of weeks ago. The single was of mixed quality, sometimes falling apart and at others, looking like properly spun thread which may have been saved. As it was, with only the odd meter of good yarn there, I threw the lot away and moved on. I watched the DVD Claire loaned me and while it was interesting, it again lacked detail, sort of teasingly touching on all sorts of subjects but then quickly moving on. I think I'm going to go back and look at it again though, paying attention to the people's hands as they're drafting, which is still my problem area. Having watched a DVD showing people spinning, I sat down at the wheel and tried again. This time, my efforts were more successful although I seem to have a major battle for co-ordination going on there. 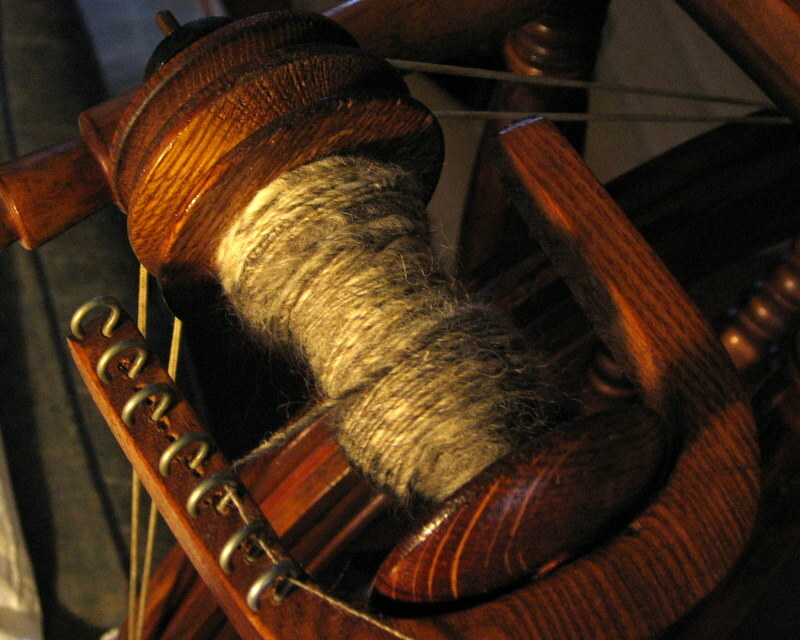 The wheel puts spin into the drafted fibre but starts travelling up into the fibre store the instant my attention and grip lapses. This means that I end up holding the fibre very tightly to counter this, which I think is impeding the drafting process, since if the fibres can't pull past each other they can't be drafted. Every now and then I did get into a rhythm though, with my grip relaxing and for maybe a few minutes, I'd be spinning properly. Then I'd lose it again, with the twist racing for the unspun fibre or the spun single getting too thin (I obviously have a repressed desire to spin laceweight). In the case of the latter, since very thin singles need a lot of twist to hold together, the single inevitably pulled apart on me. At this point, I invented a little hooky thing for pulling the single off the bobbin and back through the oriface. Previously a paper clip, it worked a treat although the design may need a little refinement before I use the wheel again. Again, I'd not claim the quality of this single is going to be much good. The yarn is very thin in places, so probably won't hold up under tension and the thickness of the rest varies considerably. In my defence, I wasn't trying to produce a nice even single at this stage. Instead, I was trying to get a feel for the hand movements and drafting, while keeping up with the wheel and controlling how much spin was in the fibre - all of which felt horribly complicated, rushed and a far cry from the relaxing action of spinning on a spindle. In other words, much, much more practice is needed! That looks quite consistant yarn looking at the photo. Like the pic of the fleece makes me want to see what it feels like though. That looks pretty good for a starting bobbin I think you will have got the hang of it pretty soon.